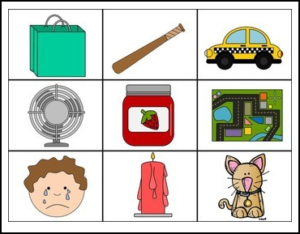 This is an easy to prep game to put into your literacy block time. There are a total of 18 cards, nine of them with pictures and nine of them with the matching printed word. Students will lay them out with the pictures or words facing down. They’ll take turns turning over cards trying to find a matching set with the word and picture. The student with the most matches at the end is the winner. They can reshuffle the cards and play again! Thank you for taking the time to look at my product. If you decide to download it, I REALLY appreciate the feedback.